Who needs to know about VAT? galleries wanting to sell work by international artists in the UK and by UK artists to customers within the EU. your turnover (gross sales - not profit) in a rolling 12-month period exceeds the VAT threshold for mandatory registration and charging of VAT. This means that if you ever get your liability for VAT wrong you could find yourself with (1) a sizeable tax bill and (2) facing penalties. Most leisure artists and those who are not successfully pursuing art as a professional full-time business are unlikely to be affected if their turnover or activities do NOT exceed the threshold for VAT registration. This page is a work in progress for the foreseeable future ​- VAT updates all the time! HOWEVER I am not a VAT specialist and you MUST NOT assume I'm up to date with all the updates! None of the information on this page is definitive, comprehensive or complete. None of the advice on this page should be treated as professional. Information and advice may also be out of date. That's because it's absolutely impossible to keep up with all the changes unless you are a qualified professional practitioner who is doing VAT full-time and there's no way I'm going to do that! However I do reference relevant government and EU guidance where I can - and official guidance is always a good place to start when checking any aspect of VAT. It also helps frame specific questions to professionals which can reduce fees due for advice given. This page also references advice and guidance from one firm which does appear to know what it is talking about in relation to the EU regime in different countries and cross border sales- and I have found few equivalents. I'm not averse to hearing about more! Value Added Tax (VAT) is a form of sales tax. VAT is a tax applicable to all goods and services in all countries within the European Union. It is applied in ways which are defined by both the EU and the government of individual countries in the EU. How do I find out more about VAT? Below you will find the relevant VAT Publication for frequently asked questions relating to VAT. ​What VAT records do I need to keep? ​How do I get a refund? The Threshold relates to TURNOVER - that is gross sales of all VATable goods and services. It's not about profit and it applies even if you're not making a profit. The threshold is based on your VAT taxable turnover - the total value of everything you sell or supply that isn’t VAT exempt. Below are the turnover thresholds defined by the UK government for (1) mandatory registration for VAT from 1 April 2016. VAT Registration Thresholds - as from 1 April 2016. The Thresholds are periodically reviewed by government. The VAT Registration Thresholds vary VERY SIGNIFICANTLY from country to country in the EU. The VAT Thresholds for anybody selling art in a country they are not resident in may be completely different. For example, if you sell art in France the threshold is NIL i.e. you need to be registered for VAT if a Non-French resident before you sell any. VAT and Artists | Visual Artists Ireland Artists - this text is a simple guide to VAT general rules and administration. Professional advice is advised for all large sums. The tariff is the rate at which VAT is levied. There are three different basic rates and then a class of exempt goods and service. The principle is that the default standard rate should always be charged unless approval has been given by the EU to vary it or the country has raised the standard rate above the default. The zero rate is reserved for essentials such as food and books (but NOT digital e-books). Accordance - Tariff rates across the EU - EU countries have flexibility about what VAT rates they implement, however the lowest standard rate that can be applied is 15%. The reality is that the VAT tax tariff rate - and what it is chargeable on - can vary from country to country within the European Union. The intention was that a single rate would be applicable across all countries. The notion was that harmonisation of tax regimes would make trade easier and enhance bonds between countries. In recent times the EU has been tackling issues of differentiation and trying to harmonise VAT across the EU e.g. the minimum standard rate of VAT is now 15% everywhere and matters relating to digital transactions are being brought into line. Boosting e-Commerce in the EU - a Fact Sheet - this identifies what geoblocking is and the nature of the specific proposals being made by the EU to promote e-commerce across borders. In general the presumption is that art is exempt (see box).. UNLESS its supply is related to business activities when art is standard rated. UNLESS art is imported - VAT is paid @5% on all art IMPORTED into the UK. VAT is payable at differing rates on imported art in other countries within the European Union. Is an artist a business? an artist's activities involve involve supplying goods (e.g. paintings) or services (e.g. commercial advice) for money. This definition should include most artists - even if their supply is irregular and/or 'not for profit'. ONLY those pursuing their art entirely as a leisure pursuit and/or making no sales have no cause for concern about VAT. Do I supply 'goods and/or services'? Supplies include sales, free gifts, loans, barters, exchange of services (but not given free of charge) made in the course of a 'business'. Artworks, art books and publications, lectures on or about art given for profit, will all be supplies for VAT purposes. The Artist’s Resale Right is exempt from VAT, so there are no VAT consequences of receiving a resale royalty. Any resale royalties you receive should not be included on your VAT return. It is COMPULSORY to register for VAT when gross turnover exceeds the VAT Threshold for registration. Include any zero-rated items - only exclude VAT-exempt sales, and goods or services you supply outside of the UK. If you register late, you must pay what you owe from when you should have registered. VAT registration thresholds | HMRC - The thresholds for registering for VAT or joining a VAT accounting scheme from 1 April 2017. VAT e-file spreadsheet | PWC - “I need to comply with HMRC's Making Tax Digital, but don't want to switch from using excel. Now I don't have to." Most items normally described as ‘works of art’ are eligible. There are some exceptions, eg technical drawings, scenery for theatres and hand-decorated manufactured items. You are eligible to use the Margin Scheme. VAT Margin Schemes are available to those who sell second-hand goods, works of art, antiques or collectibles on which no VAT was paid when you bought them. Hence there is no VAT to reclaim. you account for VAT via A VAT Margin Scheme by charging the standard rate only on the difference between the price paid for an item and the price at which you sell it i.e. the margin. If you don't make a profit you don't pay any VAT. However, standard VAT accounting must be used for all other sales and purchases such as overheads. Education is exempt if it is supplied by an eligible body. VATEDU39000 gives guidance on the types of organisation that are eligible bodies for the purpose of the VAT Act 1994, Schedule 9, Group 6. You need to know whether a body qualifies as an eligible body before you can go on to establish the liability of the supplies it makes. ​In broad terms, establishments that don't normally charge for providing education are NOT a business activity and therefore are usually an eligible body. - commercial providers of tuition in English as a foreign language - see VATEDU39600. A supply of education takes place where it is provided by way of business and in return for a consideration. For example, a fee-paying school makes supplies of education. The guidance given in VATEDU26000, VATEDU26500, VATEDU27000 and VATEDU27500 will help you to decide whether the particular organisation is making supplies of education in the course or furtherance of business. VATEDU26000 | Is a business making supplies for consideration? : is the education a supply for VAT purposes? A professional association is a body which restricts its membership wholly or mainly to those who hold or are seeking a recognised qualification from it. Membership of the association must be obligatory, or at least customary, for those pursuing a career in that profession. If an organisation provides facilities or advantages to its members in return for a subscription or other consideration, the provision of membership supplies is deemed to be a business activity by section 94(2)(a) of the VAT Act 1994. See VBNB24000. those which do not have a business activity. HMRC currently test whether or not a "not for profit" organisation is “in business” on a case-by-case basis. Subscriptions will be standard rated unless they satisfy the conditions of the exemption. Subscriptions that can be treated as VAT exempt include those charged by professional bodies, learned societies, trade unions, political parties and philanthropic organisations. ​HOWEVER this raises the issue of the PROFESSIONAL (past and present) occupations of the members paying the subscriptions. Hobby artists would appear NOT to qualify. By and large art societies in the UK are NOT "Approved professional organisations and learned societies"
The membership subscription is exempt from VAT, but with certain exclusions that are always standard-rated. - Any supplies that are not available without payment other than a membership subscription, that is, which are not provided automatically as part of the membership benefits and for which an additional sum is charged. HMRC | Guidance: Clubs and associations' VAT responsibilities (VAT Notice 701/5) - the basic rules of VAT, how they apply to clubs and associations, and how to treat VAT on subscriptions and other payments. Is a NFP organisation “in business” for VAT purposes? Deciding whether or not your NFP organisation is “in business” is critical to determining the VAT status of any income generated and the entitlement to deduct VAT on costs associated with this income. Such income could arise in the context of trading, fund raising or investment activities of your organisation. Charities don’t pay VAT when buying some goods and services. However a charity must register for VAT with HM Revenue and Customs (HMRC) if VAT taxable turnover is more than £85,000. In general, many of the activities carried out by Charities are considered to be either outside the scope of or exempt from, VAT. Charities engaged exclusively in such activities are neither obliged nor entitled to register and account for VAT on their income. In certain circumstances the activities of a charity may be considered to be in competition with commercial traders and the charity may then be required to register and account for VAT on these activities. EXEMPT from VAT: Admission charges by public authorities or eligible cultural bodies to certain cultural events such as visits to museums, art exhibitions, zoos and performances. the extent to which activities are categorised under business, educational or charitable purposes. All business activities by museums and art galleries and public bodies are always vatable. VAT Notice 718/2: the auctioneers' scheme - This notice is about the Auctioneers’ Scheme, which is a variation on the VAT Margin Scheme for second-hand goods, antiques, works of art and collectors’ items. It tells you when you may use the Auctioneers’ Scheme to account for VAT on the supplies you make. One aspect of VAT which many artists find confusing is how VAT applies to works sold via a gallery. A commercial art gallery or a gallery selling art should be registered for VAT (i.e. if if they are a viable business they should be meeting the registration threshold for turnover). This means all artwork sold via the gallery MUST have VAT added to the price. Questions about VAT tend to revolve around whether the Gallery is acting as Principal or Agent. The Gallery as an Agent can act in its own name (as an undisclosed agent) . The VAT treatment of the sales depends on the type of agency applying as described in HMRC’sVAT Notice 700: The VAT Guide at sections 22.5 (disclosed agent) and 22.6 (undisclosed agent). and/or don't understand what can be done to reduce the VAT bill and increase the net benefit for artists. get the Gallery to put in writing to the artist exactly how the VAT is dealt with. this creates a record in the event of any dispute. plus it provides a written statement that can be checked out independently with somebody who knows how VAT is supposed to work in Galleries (for example HMRC). Taxation - VAT on Paintings A Q&A article about how VAT should be charged and may be avoided. admission charges to exhibitions and whether or not they count for VAT or can be exempted or be charged at a reduced rate. Admission charges to cultural events (VAT Notice 701/47) | HMRC - This notice explains when admission charges to certain cultural exhibitions and events can be exempted from VAT, and by whom. It also covers the exemption of fund raising events by certain cultural bodies. Events, Exhibitions and Conferences - Admission to events, exhibitions and conferences in the EU is subject to VAT in the country where the event takes place.. Relevant business services are admission, stand rental and catering services. whether or not they meet the VAT registration threshold on the basis of their annual turnover. From 1 December 2012, if you make any taxable supplies in the UK, you must register for VAT here, and account for any UK VAT to HMRC. If you supply or sell art and trade across borders you will want to avoid major tax bills and fines for not following the relevant rules on VAT. find out about proof to keep and forms to complete. ​The crucial issue is the place of supply principle. The place of supply is the place where a supply is made and where VAT may be charged and paid. VAT: exports, dispatches and supplying goods abroad | HMRC - VAT may be due if you sell, supply or transfer goods out of the UK. VAT: how to work out your place of supply of services | HMRC - Understand the ‘place of supply’ and which country’s VAT rules to use when supplying services abroad. Tax on Shopping and Services - How to get a VAT Refund | GOV.UK - Not all retailers offer tax-free shopping and you can only get VAT refunds for goods bought within the last 3 months. - the supplier is responsible for delivery of the goods. The recipients of distance sales will mainly be private individuals, but they can also include small unregistered businesses, businesses making only exempt supplies, charities and public bodies. In addition, if trade is done through distance selling (e-Commerce) then the (lower) Distance Selling VAT Registration Thresholds apply - which are usually different and lower than normal VAT Thresholds. If you are a Non-Established Taxable Person (NETP), you must register for VAT in the UK and start to charge VAT if you make any taxable supplies here. For further information on NETPs see paragraph 6.2.3. Those international artists defined as a Non-Established Taxable Person (NETP) now have to register for VAT and charge VAT if they make any supplies here. This in turn changed the arrangements made by competition organisers for artwork received from international artists (people who don't live or work here for tax purposes) for exhibitions or art competitions. If you are not normally resident in the UK, you must have a UK VAT registration number before your work(s) can be submitted. You must provide your UK VAT number when you submit. those selling art by overseas artists in the UK i.e. the managers of art galleries and art fairs, the Executive Committees of Art Societies and the organisers of Art Competitions. ​VAT Notice 723A: refunds of VAT in the European Community for EC and non-EC businesses gives further information about the refund scheme. Note: This is a very brief summary and will be expanded in future to clarify further what the implications of the change in rules are. ​See some of the official publications above. Recently EU governments have expressed concern about multinational companies that choose to locate in specific countries so as to avoid paying tax on their trading in other EU countries. As a result changes were made to the VAT rules - and were implemented in the UK on 1 January 2015. For UK businesses making cross-border supplies where the place of supply is another EU member state, there is no registration threshold and VAT is charged at the rate due in the consumer’s country. NOT on the place of supply (i.e. where the retailer is located for tax purposes). This now means that ALL retailers of digital products have to register for tax in all the countries that they supply to - irrespective of whether or not they meet the threshold for VAT in this country. Unless they can find a third party to deal through who will also deal with all the VAT. Guidance on what you need to consider when deciding whether your activity is ‘business’ is in the VAT Business/Non-Business Manual. If you only register for UK VAT so you can use the VAT MOSS scheme, you’ll only need to submit nil VAT Returns. 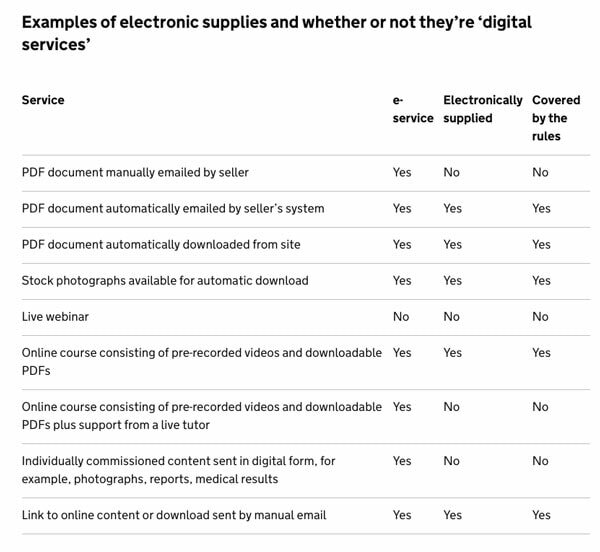 ​How does VAT apply to digital goods and services? What's the VAT Mini One-Stop Shop? Register for the VAT Mini One Stop Shop scheme Published 1 October 2014; updated 20 March 2015 AND 11 June 2015 Last updated 16 January 2018 — see all updates How to register and use the VAT Mini One Stop Shop (VAT MOSS) to report and pay VAT due on sales of digital services to consumers in the EU. Unless you sell digital services entirely through digital platforms or marketplaces, who take on responsibility for accounting for the VAT due, you must consider how you intend to account for VAT on supplies of digital services to consumers. 19 November 2018 - The guidance has been updated with new information about invoicing, leaving the scheme and which VAT MOSS Return to use to declare VAT. 16 January 2018 - This guidance now includes a 'Get help' section. 12 April 2016 - Updates to the content under the VAT groups heading. 18 January 2016 - Small amendments to content under the 'Overview' and 'If your business turnover is below the UK VAT threshold' headings. This is to clarify that some people may not be classed as being 'in business' for the purposes of VAT MOSS. 11 June 2015 - Updated to incorporate information about correcting VAT MOSS returns. 20 March 2015 - How to complete VAT MOSS Returns and how to pay VAT MOSS bill. 19 December 2014 - This guidance has been updated to incorporate information for micro businesses interested in registering for VAT MOSS. 1 October 2014 - First published. ​This collection brings together guidance and forms about VAT on the supply of digital services and the VAT Mini One Stop Shop (VAT MOSS). It's in the interests of ecommerce platforms to make it easy for clients to deal with the digital product VAT changes - and some have. That's not to say all are - and you need to check this! If you're selling digital goods to customers in the EU, you should charge VAT based on your customers' locations. It's your responsibility to make sure that you comply fully with tax laws wherever your business operates. You should familiarize yourself with EU VAT rules as they apply to you. Create: EU Digital Services VAT FAQ The 2015 change to legislation only affects sellers whose customers purchase digital products or services within the EU. Create users who have the 'Downloadable Products' facility enabled on their account and are actively selling digital products must observe these laws. Create: How To Comply With 'EU Digital Services VAT' Rules - Create offer a FREE feature within your account to calculate the customer’s VAT rate based upon their resident state for all digital products (downloadable products). How small companies and freelancers can deal with the VATMOSS EU VAT changes | Rachel Andrew - these are the basics of what small business and freelancers need to know. VAT MOSS: the facts - updated with new info from the UK government | Digital Arts Magazine - In a document published in December 2014, the government issued a document offering clarification to who and what is affected by the new laws.